New for 2012 is an addition of black colour in our collection of 100% soft cotton terry bathrobes from stock. These gowns are made from 450 GSM terry pile fabric (made on TOYOTA power looms) in a dark black colour with front pocket and belt ideal for hotels, homes or spas. The sizes availability are Sizes: S/M (44") and L/XL (50") with a length of 47 inches. These are ideal if you plan to have them personalised. These gowns are plain with a back label. Black colour is a great colour to get those logos really stand out which can be important if your logo has a lot of light colours in them. 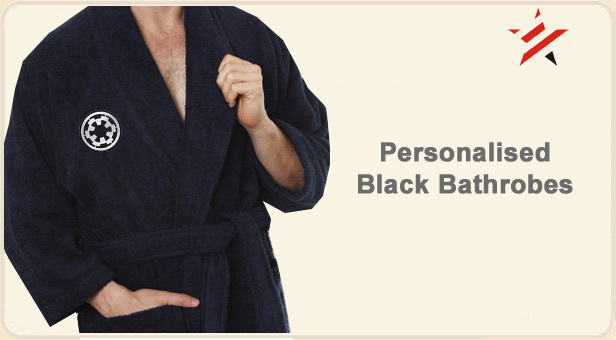 The black bathrobes which we offer can easily be embroidered with any logo of your choice. There are many positions which a robe can be custom personalised which includes the front right and left positions, sleeve, on the back or even on the belt. For a quote customers can contact us with their logo for an instant quote via email. These terry robes are also ideal if you plan to have them printed using flock vinyl transfer printing.